It is with great pride that we celebrate the team members, coaches and graduate assistants who, since 1919, created the foundation and laid the legacy for this program. Though this information makes note of the numerous awards and milestones achieved, the true proof in the quality of the Falcon Forensics & Debate Program is the success and happiness of its alumni. We have sought to construct a comprehensive history of the team, unfortunately as the program changed departments and leaders over the years, some information has gone missing. Please contact us and help us fill in the gaps. Every alumna is an important part of this team. As was said by John Adams, "We are who we were." BGSU will host this year's Novice National Forensic Association Championships. The team hosted its annual Falcon Classic/Birds of a feather swing in the fall and the Forensics "Gamers" theme tournament in the spring. BGSU hosed this year's Ohio Forensics Association State Championships. Falcon Forensics novice team members earned 2nd place in Division II at the Novice national Championships held at suffolk University in Boston, MA. The team hosted its annual Falcon Classic/Birds of a feather swing in the fall and the Forensics Promtopia theme tournament in the spring. The team moved on July 11, 2016 into the new Forensics Complex in 408 Kulin Center, the new home for the School of Media and Communication. This move took place amidst a significant shift in policies and membership. BGSU placed 1st at the Novice state Championships at Ohio University. BGSU placed 3rd in the nation at the Novice National Championships in Pensacola, Florida. Adam Wilson won best overall speaker in IPDA Debate at the Novice National Championships. The team hosted its annual Falcon Classic/Birds of a feather swing in the fall and the Forensics circus theme tournament in the spring. The team prepared for the summer move from our Forensics space in 031 West Hall to our newly constructed Forensics Complex in 408 South Hall, the new Media and Communication Building. 2015-2016 was a rebuilding season where we saw a huge shift in team membership and numbers. BGSU placed 2nd at the OFA Ohio State Championships at Capitol University. DOF, Paul Wesley Alday, was elected as Vice President of the Ohio Forensic Association. Evan Kelly qualified for and represented Ohio at the Interstate Oratory Association National Tournament in Omaha, Nebraska. Spencer Coile placed in the semi-final round of the Interstate Oratorical Association National Tournament at Berry College in Georga. The season took the Falcons from SW Baptist University in MO to Western Kentucky University, Northwestern University, Marietta College, Eastern Michigan University, Suffolk University, Nassau Community College, West Chester University and Bradley University through two major snow storms and one of the most successful competative seasons in years for the Falcons. BGSU placed 6th in Presidents II at NFA Nationals at Eastern Michigan University, NAFS in Orlando, Florida and the 1st at NCT Nationals in Indianapolis, Indiana. Jayme Salazar Qualified for the Interstate Oratorical Association National Tournament at James Madison University. BGSU is the co-founder of the North American Forensics Society (NAFS) with John Schultz (1999) BGSU Alumni) at Tallahassee Community College and hosts the first Continental Championships in Toronto, Ontario. BGSU places first in IE and 2nd in Debate. 1st place Reader's Theatre "The Lion King", 3rd place Reader's theatre "Skin"
Spencer Coile placed 2nd with an Informative Speaking on "Biological Teleportation"
Nicholas Blaine placed in the quarter final round of NFA Extemporaneous Speaking. 2nd place OFA State Championship in the open division. The team hosted the Falcon Classic with BGSU Firelands College and the theme tournament was "Rounds of the Living Dead (part I & II)"
The team hosted the "Once Upon a Round & Happily Ever After" Theme tournament. Our swing partner for the Falcon Classic was Hillsdale College. The team hosted the "2010: A Forensics Odyssey - Because We're Aliens and that's How We Roll" Theme tournament as a swing tournament with Central Michigan University. The team hosted the BGSU "Get A Clue" Theme tournament featuring both debate and IE events in a mystery theme. Our swing partner for the Falcon Classic was Miami University. The Falcon Forensics, Speech and Debate Team had a highly successful season placing as a team at each tournament. The team also participated in OFA, NFA, PKD Nationals and IFA in London, England. The team offered the student-run Superhero Bang-Thwap-Crack-Pow Theme Tournament. This season saw BGSU win the national championship at the NCT National Comprehensive Tournament in St. Louis, Missouri with national champions in Prose, Extemporaneous Speaking and Student Congress. 2007-2008 also saw BGSU's first attendance at the International Forensic Association Championships in London, England, placing 5th with its first ever International Champion, Michelle Baker, in Persuasive Speaking. Director of Forensics, Paul Wesley Alday was honored as the "Ohio Forensic Educator of the Year" by the Ohio Forensic Association. The Falcon Forensics, Speech and Debate Team had a homecoming, moving from the Department of Theatre and Film to the School of Media & Communication /Department of Communication. 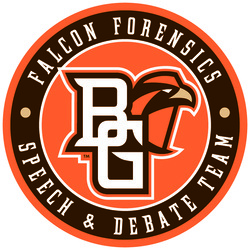 BGSU also hosted the Ohio Forensic Association Novice State Championships and two regular season tournaments, “The 63rd annual Falcon Classic” and the “Pirates of the Competition” themed tournament. Director of Forensics, Paul Wesley Alday, was honored by the BGSU Office of Campus Activities as the 2006 Advisor of the Year for his work with Pi Kappa Delta. Director of Forensics, Paul Wesley Alday was honored by BGSU as a top three finalist for 2005 BGSU Educator of the Year. 1st Place Team Sweepstakes Collegiate Forensics Association Tournament in Montreal, Quebec. 1st Place Ohio Forensic Association Varsity State Championship. "Superior" Ranking Pi Kappa Delta Provincial tournament of the Greater Northeast. Paul Wesley Alday joins BGSU as the new Director of Forensics. 7th Place Presidents Division III Team Sweepstakes, National Forensic Association National Championships. BGSU inaugurates an Annual High School Speech Tournament that was widely supported and attended. BGSU establishes the Forensics Honorary Debate Tournament, limiting participation to 16 hand-picked programs and inaugurated the President Ralph C. Harshman Trophy. Dr. Raymond Yeager, BGSU Forensics Director, was elected as National President of Pi Kappa Delta at the Oklahoma State University National Convention. Bowling Green State University hosts the 1959 Pi Kappa Delta National Convention. After the WWII “War Years”, debate and speech activities faced reorganization as veterans returned to the academic ranks. Pi Kapa Delta sponsored the first annual “Pi Kappa Delta All Campus Debate”. Bowling Green State University hosts the 1947 Pi Kappa Delta National Convention. Bowling Green State University hosts its first “Invitational Speech Tournament” or what is now known as the “Falcon Classic”. The 1936 “Key Yearbook” reports, “Debate undoubtedly has taken its place, along with athletics as one of the most outstanding programs in the college curriculum”. Bowling Green State University hosts the Pi Kappa Delta convention for the Province of the Lakes. BGSU wins its first individual event award at this convention, 1st place in Extempore Speaking. Dr. H.B. Williams, the first president of Bowling Green State University, spoke on the topic “The Social Contributions of Public Speaking”. Founding of the Ohio Eta Chapter of Pi Kappa Delta at Bowling Green. B.G. changed from a “Normal School” to a “State College”. BG competes in its third International Debate Series against Oxford University of England, BGSU won on a unanimous decision. BG attends their first Pi Kappa Delta National Convention in Wichita, Kansas. Bowling Green State College hosts the State Peace Oratorical Contest, forming the basis of what is now the Ohio Forensics Association. “Les Liseurs” (The Readers), an organization fostering events in oral interpretation was formed by Dr. J.W. Carmichael. BG developed a contest method and hosted the regions first Oral Interpretation Contest with the State Normal School in Ypsilanti, Michigan (Eastern Michigan University). Bowling Green State Normal School participated in the first Intercollegiate Debate Series, earning a final round against Cambridge University of England on the resolution, “Resolved: That this house pities its grandchildren.” Cambridge emerged as the victor in a closely split decision. These years were recorded in a cumulative copy of “The Key” Yearbook instead of individually. Bowling Green State Normal School participated in its first intercollegiate debate contest in a series of two debates against Hillsdale College on the resolution: “Resolved: That the United States should not own or operate the coal mines of this country.” Bowling Green was deemed the victor in both contests, thus establishing a legacy of excellence.